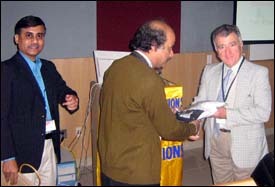 In Kolkatta, Ephremides (right) is presented with a memento of his visit to India. Tony Ephremides (ECE/ISR), the Cynthia Kim Eminent Professor of Information Technology, gave three international lectures in December. Ephremides is one of the IEEE Communication Society's Distinguished Lecturers, and gave three invited talks on "Cross-Layer Design in Wireless Networks." He traveled to IEEE chapters in Kolkatta, India on Dec. 18; Kuala Lumpur, Malaysia on Dec. 20; and Jakarta, Indonesia, on Dec. 22. In India, the location was the WIPRO campus outside the city of Kolkatta. (WIPRO (West India Products) is a large diversified multicompany of high tech and other products. In Malaysia and Indonesia, Ephremides spoke at local universities.